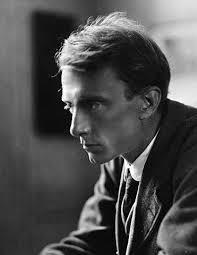 We teach the OCR exam board’s AS module F661, opting for Edward Thomas as the poet for close analysis. 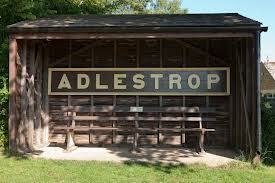 Oddly, the board do not include ‘Adlestrop’ in their selection of poems. So in the opening sessions, here’s a way of gentling students in to the processes of closely analysing a poem while also showing them Thomas’ most well-know piece. Discuss with the class the idea of syllable counting in a verse line. Get them to try it by asking students to write an 8 or 10 syllable line beginning “Yes. I remember . . .”. Perhaps one of each. For the exercise that follows (for those who want more restrictions) suggest keeping to an 8 or 10 syllable per line. Others (possibly the less able) may prefer more freedom . . .
Now . . . tell them to imagine they are travelling – some form of transport, walking, bike, train, bus. Ask around to reveal what they are imagining. Try pushing it a bit further, for more details, the car, the time of day, the scenery . . .
Now write 4 lines – a quatrain – in which you describe travelling and arrival at a particular location, at a particular time of year. They stop there. Maybe suggest they might open with “Yes. I remember . . .”. again – but not compulsory . . .
Next, write 4 lines in which you have stopped at this place – you hear a variety of noises – describe them . . .
Next write 4 lines in which you give a description of what you see – first 2 lines things close by – second 2 lines things further off . . . Finally write 4 lines in which your attention continues to drift away into the distance, ever more remote from where you stopped; suggest it is wholly up to them where they stop with this one – attention may be drifting for miles, even for years . . . Very optional 4 lines depending on how well they are going – in which they may conclude the piece in any way they wish. Interestingly, Thomas does not make use of this option, does not conclude in any neat fashion; a point for discussion later perhaps. . . Finally, show Thomas’ own poem. Give out copies. By this stage, students will be likely to have opinions and/or questions about the way the original piece deals with the same material they have just written about. Homework: to type out the lines created during the lesson – taking any opportunity to alter or just tidy them up to be presented next lesson. Next lesson – Take the poems they have typed up. Copy them and re-distribute them, one to each student (not their own poem though). Ask them to identify and annotate SIX items from the poem in front of them where they perceive the writer has made use of technical devices. The teacher might ‘mark’ the original creative piece; certainly a ‘mark’ might be derived from a student’s annotation of another student’s poem.